Ham: Ham or jamón (Spanish) is a weakness for most Spaniards. It is a prized meat and most people will be ready to pay a good price for a premium-quality ham. Olive oil: Olive oil forms the base of almost all dishes in the Spanish cuisine. The use of this oil is proof enough as to why this cuisine scores better than other cuisines in terms of its nutrition quotient. Eggs: Eggs are used in desserts and special snacks. Also, Tortilla Espanola, the world-famous Spanish omelet is a must-try on any Spanish menu. Nuts: Hazelnuts, walnuts, and almonds are produced in plenty in Spain. Desserts and crackers made in Spain use nuts, especially almonds, in plenty. One such sweet dish is Turron, a candy that is almost an indispensable food item on festive occasions. Garlic: The Spanish main course will definitely have garlic as one of the key ingredients. This spice makes Spanish cuisine quite heart-healthy too. Apart from the above ingredients, sausages, beef, pork, and roasted meats are important components as well. 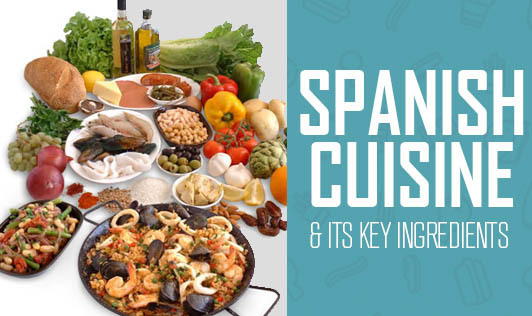 The next time you plan a trip to Spain, try not to miss out on the cuisine. It is rich and it celebrates their culture.